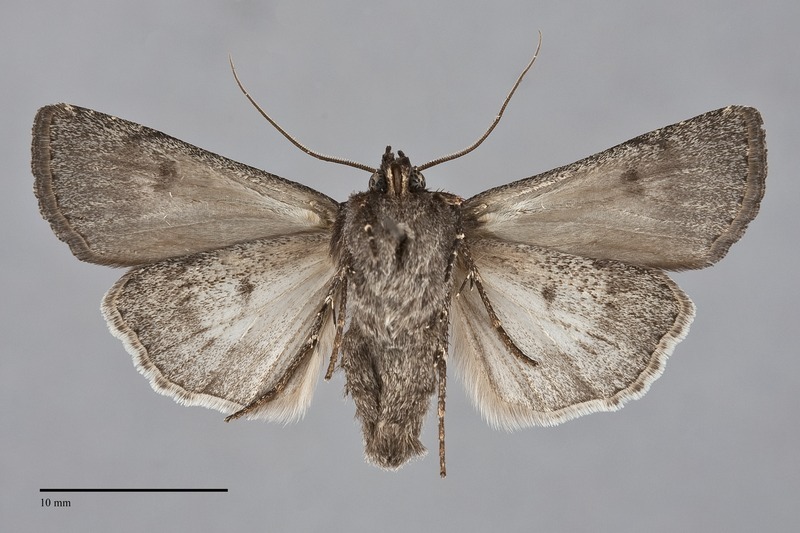 Euxoa punctigera is a moderately large Euxoa (FW length 15–20 mm) with uniform very dark brownish gray forewings with thin powdery light peripheral lining of the spots that flies in dry forests in late summer and early fall. The forewing color is nearly uniform, lightly sprinkled with gray along the costa in some specimens. The basal, antemedial, and postmedial lines are dark gray to black, inconspicuous except as paired black spots flanking gray on the costa and gray filling in the antemedial line in a minority of specimens. A dark gray spot on the costa marks the position of the subterminal line in most specimens, and this line is evident as pale yellow spots in a few individuals. The orbicular and reniform spots are outlined in black and scattered light yellow scales and filled with the ground color. The orbicular post is small, oval. The reniform spot is kidney-shaped. The black claviform spot is small. 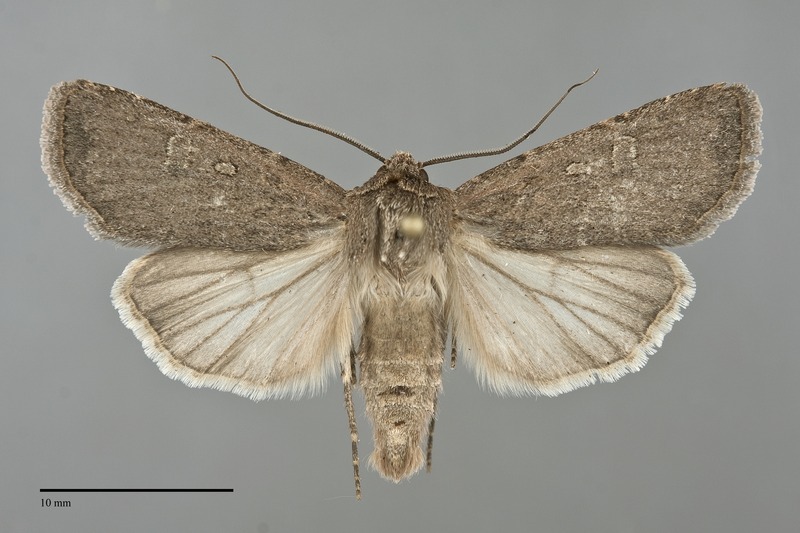 The hindwing is light gray in males, slightly darker in females, with darker gray marginal area, veins, discal spot, and terminal line. The hindwing fringe is two-toned gray. The head and thorax are uniform black-gray. A frontal tubercle is present. The male antenna is biserrate. 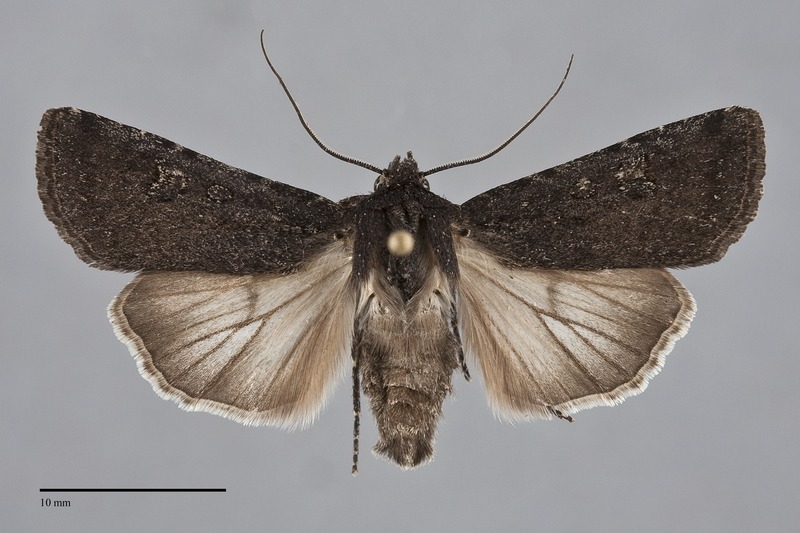 Euxoa punctigera is a member of the subgenus Euxoa. Euxoa punctgera can usually be recognized by its late summer flight period, the uniform blackish forewing, and the indistinct pattern dominated by scattered light yellow scales inside the small orbicular and reniform spot. 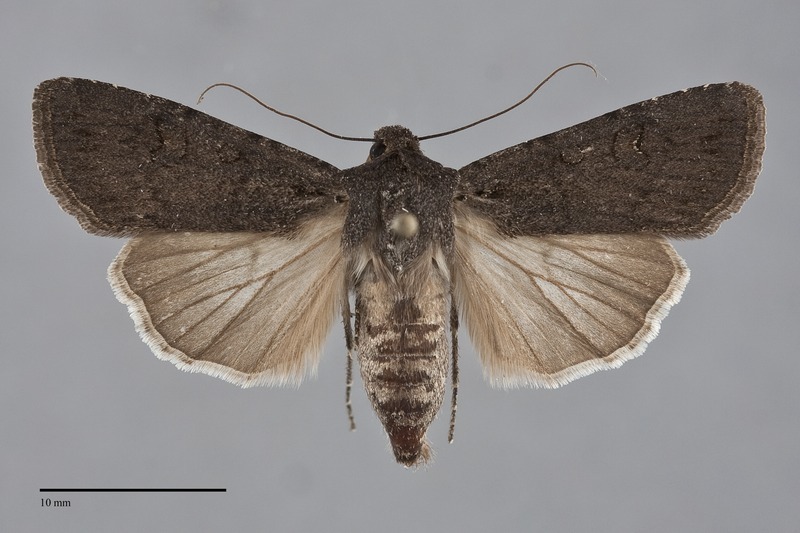 Other very dark Euxoa species either have no pale scales in the spots (very dark forms of Euxoa satis and Euxoa perpolita), or more extensive light filling than in E. punctigera (Euxoa tessellata). 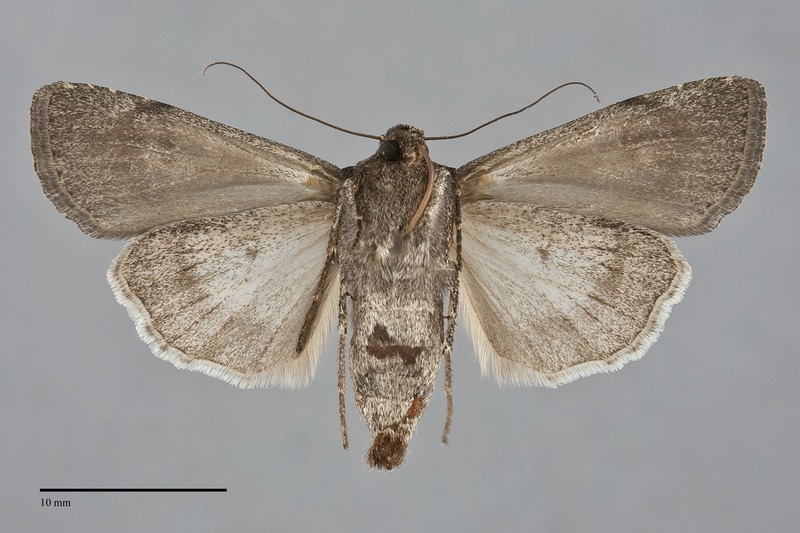 The most closely related species, Euxoa cana, resembles E. punctigera in general pattern but is much lighter gray with prominent dark transverse lines and has a lighter colored hindwing with conspicuous dark veins. The type locality of Mamestra punctigera Walker is Vancouver Island, British Columbia. This species is widely distributed in forests throughout much of western North America. In the Pacific Northwest, it is usually rare west of the Cascades in coastal rainforests, oak woodlands, mixed hardwood-conifer forests, and spruce-fir forests. It is more common in dry forests east of the Cascades, especially in ponderosa pine forest. The experience in Oregon suggests that it is much more common during wet years than during droughts. Similarly, E. punctigera occurs on sagebrush steppe during wet years, but mostly disappears from this habitat during drier years. It was also eliminated from sagebrush-juniper woodland after a wildfire, but was present in adjacent unburned habitat two years after this disturbance. Euxoa punctigera is widespread in dry forests in our region as far north as southern British Columbia. It has not been found west of the Cascade Mountains in Washington, but has been collected on Vancouver Island and in southwestern Oregon. The range of E. punctigera extends south to Utah and Colorado in the Rocky Mountains and to southern California through the Sierra Nevada. 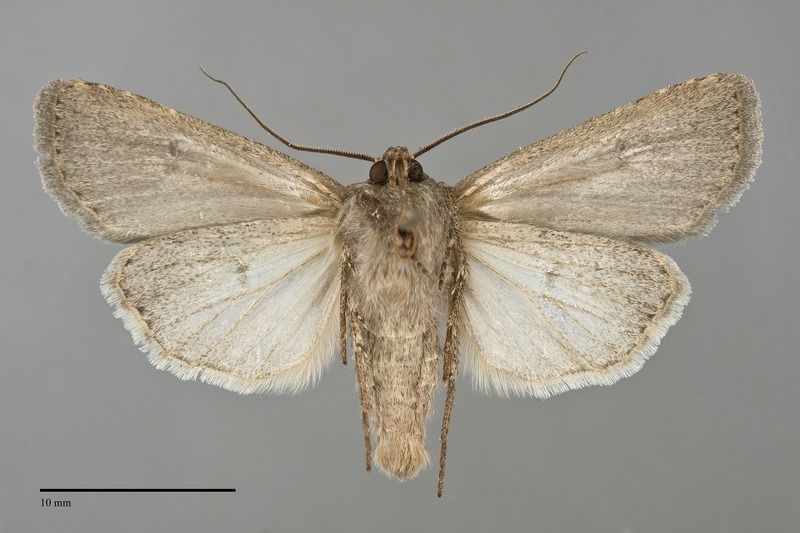 This species flies during the summer and early fall. The records from our region extend from early July through September, with most specimens from August. This species is nocturnal and comes to lights.